First of all, the greeneyes are marinated then covered with deep-fried powder before being frozen individually. As it is already covered with deep-fried powder, you may just fry it with oil directly. 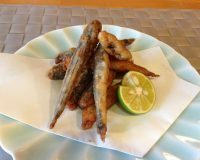 You may add sweet vinegar sauce or nanbanzuke (Japanese sweet vinegar mixed with chopped green onion and red pepper)to it after deep frying. It is a perfect dish to serve as a side dish or a snack.